American Banker recently published an Op-Ed from Jim Wehmann, head of FICO’s Scores business. In it, he delineates some of the risks associated with the approach being promoted by those claiming that tens of millions of previously “invisible” consumers can qualify for mortgages based on data that exists today in their credit bureau files. An important debate is occurring in the mortgage industry about ways to expand access to credit. The Consumer Financial Protection Bureau recently published a thoughtful report regarding the number and composition of consumers who lack the most significant gateway to credit access: credit scores. FICO’s own research shows that while approximately 190 million Americans have FICO scores, the credit files of roughly 28 million people do not currently have one. You may have heard claims that these credit files can indeed be scored. Some have called for the Federal Housing Finance Agency, Federal Housing Administration, Fannie Mae and Freddie Mac to adopt such alternative scores. Unfortunately, scoring these particular credit files through an approach described by some as “innovative” is unreliable and even harmful to the very individuals the CFPB highlighted. FICO’s mathematical scoring formula has always had the ability to assign scores to every credit file. The “innovation” of alternative models amounts to eliminating an analytically driven rule we’ve always implemented to ensure the integrity of lending decisions. We prevent incomplete data (less than six months of credit history) and old data (credit files that have not been updated within the last six months) from generating scores that would be unreliable and potentially harmful. All credit score vendors can build models that eliminate or significantly weaken this rule. These models will even appear to perform well due to the low proportion of active credit across these newly scored credit files and, therefore, in the data sets used to build and validate these credit models. Notwithstanding the perception that all is well, millions of individual scores will lack an acceptable degree of accuracy, causing great harm to lenders and consumers. Studying the impact on the largest segment of the 28 million “unscoreables” best illustrates why. Eighteen million consumers (65% of the 28 million) have negative events, such as bankruptcies and collections, in their credit histories and have no active credit products. By contrast, millions of other Americans have also experienced such events and the vast majority remain “scoreable” because they maintained access to at least one form of credit — perhaps a student loan or auto loan. Because their credit files are continually updated with current payment information, we can observe their return to creditworthiness. Credit scores quickly rebound for many. For example, FICO conducted research into the 1.7 million people who incurred a bankruptcy between October 2009 and October 2010. Between October 2010-October 2014, the number people in this group with credit scores above 600 more than doubled — from 25% to over 55% of this population. At the same time, 3.4% of the bankruptcy group had no credit score during this period, yet they’re similar to those described above. Many have rebuilt their lives and are once again paying their bills. The difference is that, for various reasons, they have no active credit products being reported to the credit bureaus. With no payment updates, the credit bureau file is stuck at its most impaired, dominated by the negative event. Such credit files generate scores that are unreliable and too low. They are especially harmful to consumers because they ensure rejection by lenders’ automated risk management systems. Intentionally returning no score, rather than an erroneously low score, can actually increase borrowers’ likelihood of approval. Lenders may then consider other factors, such as verifiable income and assets, more fully. There are other, smaller segments in the 28 million that generate unreliable scores for equally problematic reasons. Scoring first-time borrowers the month they open a $500 retail card, for example, says almost nothing about how they will handle a $200,000 mortgage. Good reasons can be found to support the adoption of new scoring models. But attempting to score 28 million people on credit bureau data alone isn’t one of them. Given the harm to consumers and lenders, we hope that anyone who’s still calling for this approach will reconsider. The result is much higher credit scores. An approach utilizing alternative data results in only 3% of people scoring below 500. Best of all, when even a few dozen credit card issuers utilize a score based on alternative data, millions of people will obtain a new credit product that will establish or reestablish an active credit file. This in turn will allow them to generate the traditional FICO scores already widely accepted by thousands of lenders. No longer “invisible,” these millions will finally have access to mainstream credit products with thousands of lenders competing for their business. 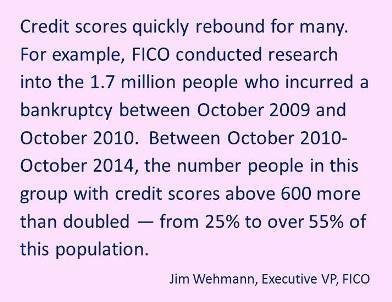 Jim Wehmann is executive vice president of scores at FICO.